The Battle between the Vicar of Tytherington and Squire Hardwicke. Squire Thomas Hardwicke made an agreement with 28 year old William Henry Moncrief Roberson in 1830 that the latter would hold the position of vicar at Tytherington until Hardwicke's elder nephew had finished his studies at university and become vicar. Hardwicke was clearly planning to keep the living in the Hardwicke family but unfortunately the nephew died before he had taken Holy Orders. The Squire then told Roberson that he intended to substitute his younger nephew as vicar of Tytherington. Roberson refused to agree to this saying that he made the agreement to vacate the post when the elder nephew had taken Holy Orders and he would not vacate it for anyone else. Squire Hardwicke was furious and his wife wrote a pleading letter to Rev Roberson imploring him to let their younger nephew take the living. Still Roberson refused and gradually the relationship between Vicar and Squire deteriorated. Hardwicke was a man used to having his own way and rather than using diplomacy he began to aggravate Roberson. He knocked down the dividing wall between the vicarage (today called The Manor House) and the manor (today The Grange) and had it rebuilt nearer to the vicarage, thereby gaining more land for the manor gardens. The Squire was possibly within his rights, for he owned the manor and was patron of the living, so had a claim on the vicarage and the garden. He also filled in the duck pond on the rectory glebe land and made a garden there, knowing that Roberson enjoyed the ducks on the pond. Roberson continued to refuse to leave and the tension grew, made worse by the Squire and the Vicar living in adjacent properties. There was a short cut from the manor buildings through a door into the vicarage land and the Squire's cowman took the cows through that door twice a day. This was a gentlemen's agreement but Roberson did not regard Hardwicke as a gentleman and so he locked the door. Squire Hardwicke lost his temper and smashed the door down with an axe. The cowman drove the cows through the doorway and, with the Squire's approval, made them trample all over the vicarage land and gardens. Roberson decided to sue the Squire for damages and trespass on his property. Hardwicke made a counter-claim but Roberson won the day in court. The County Court awarded damages to Roberson and granted an injunction against the Squire, who had to restore the duck pond. The Squire was a very angry man and apparently walked about the village like a man possessed calling the vicar a young upstart and not fit to be the priest in Tytherington. The vicar on the other hand settled down to a very comfortable living to which ordinarily he might not have expected to aspire. Squire Hardwicke sold the living and no longer wanted to be associated with Roberson or the Church, never attending again. Rev. Roberson did not feel benevolent towards the village under such a Squire and sadly for the village community did only the minimum at the church. 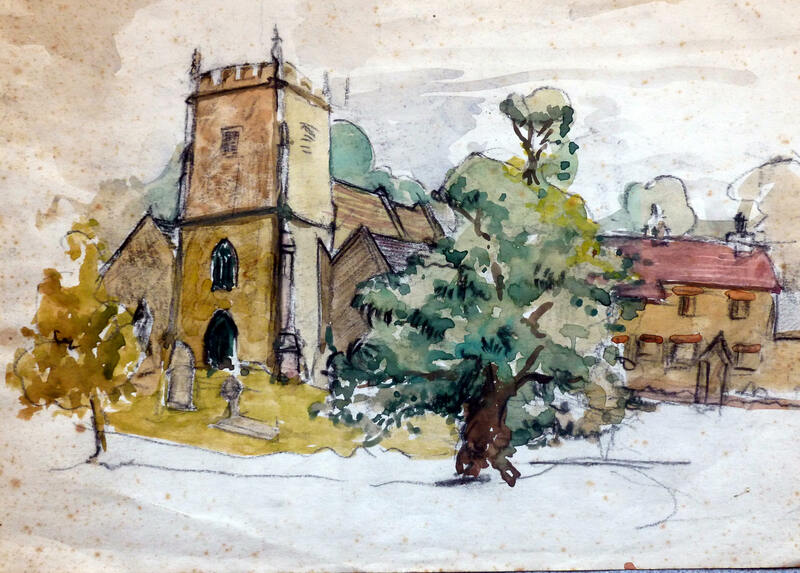 While other villages were building church schools, Tytherington was left without one because of Roberson's idleness. A National School was built in 1878 with no connection to the church. Tytherington was visited by a writer, Joseph Leech, on 10th October 1846. He was surprised to find villagers loath to talk about the church or Rev. Roberson, some saying they hadn't been to church since Roberson's arrival. Leech found a 'stand in' taking the service, which was a charade without singing or sermon, and an uncouth slovenly clerk. He was told if Rev. Roberson had taken the service it would have been quicker. There was no singing because the vicar didn't see the use of hymns. He did however make a point of preaching very long sermons, presumably to keep villagers away. Sadly for the village and the community Roberson stayed in the village for 50 years until his death in 1881.